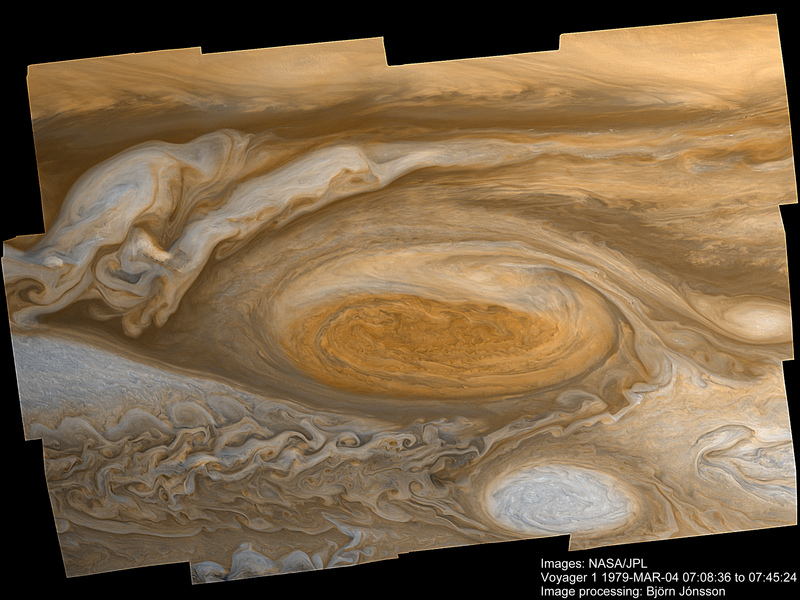 This is the view from a spacecraft in orbit around Jupiter, looking down at the huge anticyclonic storm known as the Great Red Spot. This storm has been a permanent feature of Jupiter for over 300 years, when it was first discovered, and it is clearly visible through a telescope from Earth. The size of the storm as shown in this picture is large enough to swallow the Earth two times whole and then some, which gives an idea of how enormously huge Jupiter is. The texture of the planet comes from a mosaic of photos from NASAs Voyager 1 flyby in 1979, assembled and processed by Björn Jonsson (as seen here). Shown here is a spacecraft floating through the amazing cryo geysers on the south pole of Saturn´s moon Enceladus. These geysers (discovered by the Cassini spacecraft in 2005) are formed along cracks in the moons icy surface and shoot powerful jets of – amongst other stuff – water vapor and ice particles into space. Some of the plumes reach heights of several hundreds of kilometers, and while most of it falls back as “snow” on the surface, some particles are shot into space and become part of the famous Rings of the parent planet of Saturn. The geysers are one of many hints that there are large bodies of liquid water under the surface of the moon, making Enceladus a prime target for the search for extraterrestrial life in the Solar System. To read more descriptions like these from the film, check out the official site at erikwernquist.com or click any of the titles below.